Over the weekend my husband and I finally watched the A&E Andromeda Strain miniseries (not having to sit through commercials = excellent). He has a much better recollection of the novel than I do, so he helpfully commented every time there was a discrepancy, which was pretty often. Now I don't personally think that's a problem. I'm fine with updating and reimagining of novels and movies, as long as it improves the story. Unfortunately, that wasn't the case. I actually thought the first half of the miniseries was pretty entertaining. There was the horror of the unknown factor that killed (nearly) an entire town, the drama of Dr. Angela Noyce using her superior female baby-hearing skills to find the one infant who survived, the cool scientific gadgets in the secret underground biological testing laboratory known as "Wildfire", the desert animals passing the disease from dog to rabbit to snake to rat, and the mutated Andromeda strain destroying the plastic and rubber of a nuke-carrying fighter jet. I was annoyed by the introduction of a worm hole as the source of the microbes, but I figured that the series producers had some money left over in their CGI budget that they needed to spend on something, so why not a swirly hole in space? Unfortunately, the series seemed to lose its way in the second half. It wasn't good enough that Andromeda was a lethal space microbe. Of course not. The microbes, it turns out, had a message on their "shells". Unlike most alien messages this one was pretty easy to decipher because it was actually encoded ASCII - just one of the giant leaps of logic the science team takes that turn out to be absolutely correct. So ASCII, that means humans. And that's where the plot goes seriously off the rails. You see, the ASCII message was "Bacillus infernus". Fortunately, one of the science team, Major Keane, just happens to have worked with that bacterium before. The obvious conclusion? 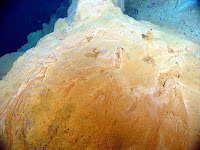 Bacillus infernus, which grows in deep sea sulfur-rich hydrothermal vents, must be the natural enemy of Andromeda, which happens to be sulfur based. And that must be why Andromeda appeared - Earth's inhabitants in the future must have sent a sample of the strain back in time through the wormhole, tagged with the microscopic message, because strip mining of the vents in our present destroyed the Bacillus's habitat, so they had no way to fight the lethal microbe. Obvious, right? And, of course, it's a plot by conspirators in the military and government that cause the problem in the first place, since, when the crisis is over, we see a sample of Andromeda being stored away on a space station for the future. And yes, if you are thinking Andromeda's origins are an ontological paradox you'd be right, since the present-day sample was from our future, and the future sample came from our present. Might there be some biological reality to redeem the Andromeda story? Not really. The environment near hydrothermal vents is (not surprisingly) very different from here on the surface - high temperatures (greater than 195°F/90°C), and, more importantly, oxygen-free saltwater. Scientists have only been able to grow cultures of the vent microbes under anaerobic (airless) conditions. That makes it unlikely that they would be functional at all when sprayed from a helicopter. There were other bad bits in the movie too: the whole government conspiracy subplot with intrepid reporter Eric McCormack on their trail (especially the bit where he races across the desert with a pot-smoking woman who doesn't seem particularly sad about the death of her boyfriend), the way the spreading microbes paint the landscape red, and the way the color instantly vanishes when sprayed with the predatory Bacillus, how Dr. Chou dies so quickly in the nuclear reactor water and Dr. Barton survives Andromeda eating away her protective suit - to name a few. It's a shame the makers of The Andromeda Strain weren't satisfied to tell a story about "simple" lethal microbes from space. 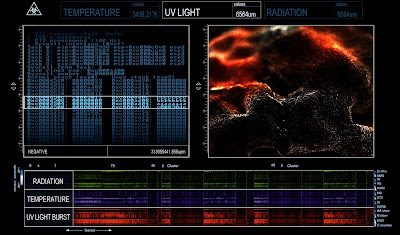 Top Image: Diagram from the "Wildfire" intranet showing the effect of light and radiation on Andromeda. Bottom Image: NOAA Ocean Explorer. "Yellow and orange microbial mats form a “bioreactor” mound with a thin crust and small chimneys on top. The crusty outer coating acts as a thermal blanket to elevate the internal temperature from diffuse venting and help retain reduced microbial nutrients."